Click to visit Tropic Trailer website! 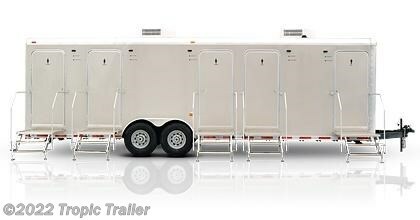 The Century V is the largest of the single bathroom cubicle models we build. It was designed around the largest gatherings we could think of such as corporate golf outings, upscale special events, state fairs, etc. With 2 - 3/8 polyethylene holding tanks and over 850 gallons of capacity, the Century V can accommodate up to 2,600 flushes.